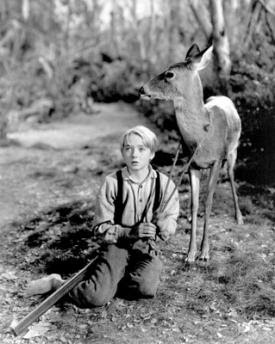 Today, I'm reviewing the classic coming of age film, The Yearling (1946), about a young boy (Claude Jarman, Jr.) and his pet fawn. This article is part of The Animals in Film Blogathon hosted by In the Good Old Days of Classic Hollywood. 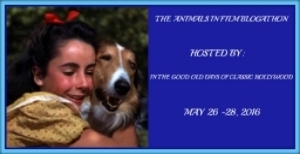 The Yearling (1946) is one of the best old Hollywood films about the animal kingdom. It deals with both nature's beauty, in the love between a young boy and his pet deer, and nature's fury, in a pioneer family's attempts to scrape together a living in the Florida wilderness. The Yearling tells the story of the Baxter family -- father, Penny (Gregory Peck), mother, Orry (Jane Wyman), and 12-year-old Jody (Claude Jarman, Jr.) -- who are living a hand-to-mouth existence in the Florida backwoods shortly after the Civil War. The Baxter's live a mostly isolated life, which means that Jody often seeks out animals for companions. One day, he adopts a fawn that has lost its mother, and he and the deer, whom he names Flag, become inseparable. Trouble begins when the fawn becomes a yearling and begins to destroy the family's crops. The Yearling, which is based on the Pulitzer Prize-winning novel by Marjorie Kinnan Rawlings, had one of the most troubled productions in old Hollywood history. MGM bought the rights to the novel soon after it was published in 1938. 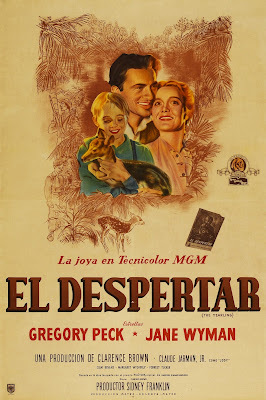 In 1940, MGM planned a lavish production filmed on location in the Ocala National Forest starring Spencer Tracy, Anne Revere, and a newcomer named Gene Eckman, but that production encountered numerous problems including bad weather, uncooperative animals, and clashes between Tracy and director Victor Fleming. (The Florida State Archives has a wonderful slideshow of sets from that version of the movie that you can view here). 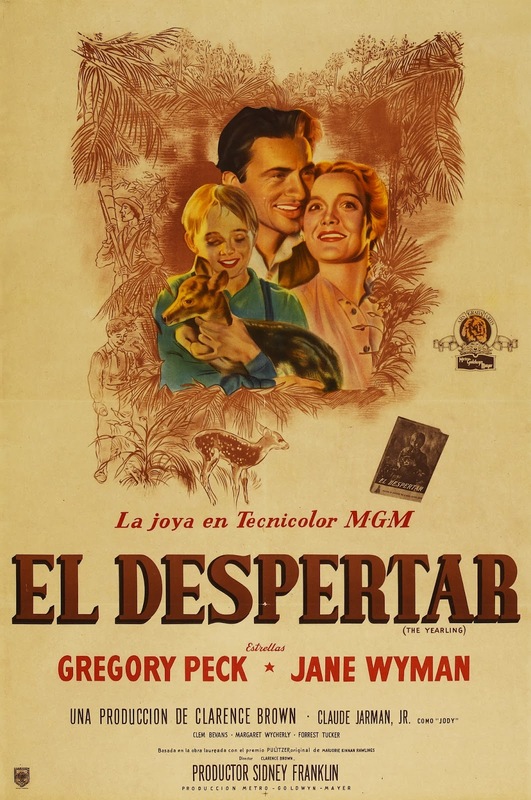 With World War II looming on the horizon and the movie running severely over-budget, MGM closed down production of The Yearling until 1945. The movie was still filmed on location in Ocala, but now there was a new cast, including Nashville, Tenn., native Jarman, who was found during a nationwide talent search, and a new director in MGM veteran Clarence Brown. Claude Jarman, Jr., in The Yearling (1946). The resulting film, which opened to great acclaim in 1946, is a masterpiece of American cinema. Brown and cinematographers Arthur Arling, Charles Rosher, and Leonard Smith created one of the most gorgeous Technicolor movies of all time with the deep green and browns of the Florida wilderness contrasting with a background of bright blue skies. The movie is also wonderfully acted, featuring great performances by Peck, who plays a wise, understanding father in the mold of Atticus Finch, and Wyman, who gives a masterful performance as a woman who is emotionally closed off because of the wounds life has inflicted on her. Jarman also makes an auspicious film debut as the sensitive and excitable Jody. He gives a performance that is very much in the manner of MGM child stars of the 1940's complete with wide eyes and lots of bawling (think Margaret O'Brien), but his performance is also quite intuitive, and it merits the special Academy Award he received for a juvenile performance. Brown, who was best known for working with Greta Garbo, knew he had another actor who could tell a story with his face, and he lovingly frames Jarman in a series of closeups with his beloved fawn. 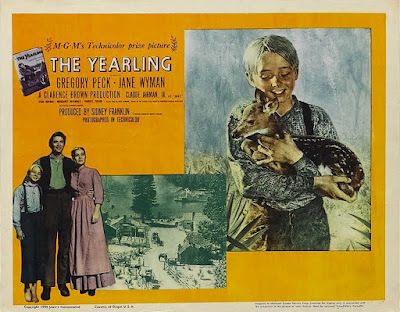 In fact, The Yearling and Jarman's extraordinary performance set the template for so many later coming of age movies from Old Yeller (1957) to The Fault in Our Stars (2014). There's the loss of a beloved pet, a terminally ill, wise beyond their years best friend (Donn Gift), and plenty of father-son discussions about the meaning of life. The Yearling is also extraordinary for its depiction of the natural world. This movie depicts nature as both an extraordinary wonder and a harsh taskmaster. The Florida swamps are one of God's great creations, but they also pose dangers to the Baxter's from bears that kill their livestock, rattlesnakes, and hurricanes that destroy their crops. Even Flag, who brings so much joy to Jody, becomes unmanageable when he gets older. After a bitter struggle, Jody learns how to live in harmony with nature, and the film ends with him dreaming about his beloved pet. FYI: If you are ever near the Ocala National Forest in Silver Springs, Fla., you can walk the Yearling Trail, which features locations from the movie. Here's their website. The Yearling is available on DVD, Blu ray, and video on demand. Truly this film is Clarence Brown's masterpiece, and I am a huge fan of everything he has done. I find he had a particular knack for stories about children as outsiders. Clarence Brown is a criminally underrated director. He has such a lyrical style that perfectly suited Garbo and The Yearling.